Or as my husband, Pj always says "I get the blonde and the one in the toybin!" Well, I had planned to continue my sculpture pin curl posts but the past week has been too crazy and my hair was in dire need of a root touch up. I did the bleaching yesterday and got caught up with laundry so while my hair is bright yellow today, I thought I'd do a cute turban to cover it until I can complete my dye job this evening. 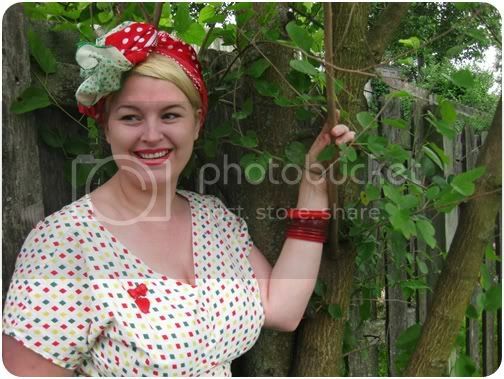 It's summer, hot, humid and I will be wearing a lot of turbans in the coming months. I adore those huge colorful fabric turbans of Africa and the Caribbean and wanted to find something like that. Solanah of Vixen Vintage wrote a beautiful tutorial for an easy, voluminous turban using 3 scarves so I did that one today. I love it so much, I think this one will be my go-to this summer. Thank you, Solanah! See some other ways that I like to tie scarves on my tutorials in the navigation above. Today I also wore my vintage/handmade diamond dress. It started out as a green 50's dress that was way too tight in the bust so I cut off the skirt and made a new bodice with this cute vintage fabric. See this dress again from my previous post. Wonderfull dress, you look so nice! I love your hairstyle, too .... I've to try this. You always look so pretty & stylish. 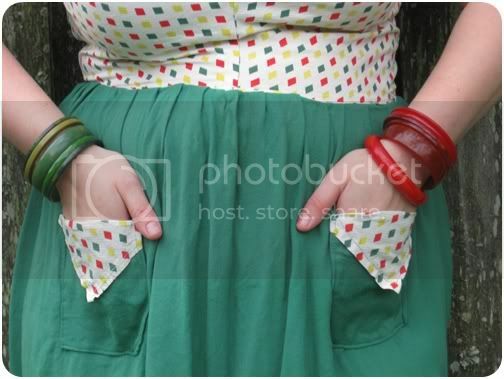 Love the warm, punchy palette of this charming outfit. You excel at always looking so perfectly pulled together, dear gal, no matter if you're hiding your "under construction" hair or showing off every last beautiful lock. 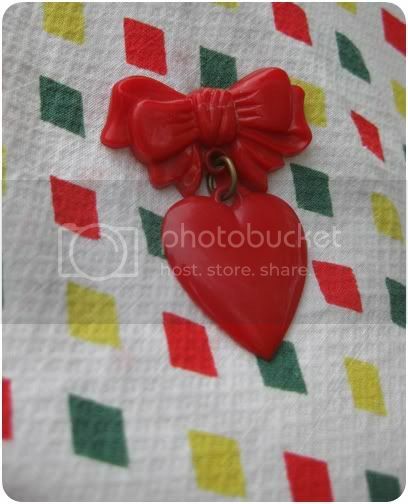 *PS* I have virtually the same red heart vintage brooch - soooo cool! Don't you just love Aris Allen shoes? I have so many pairs. 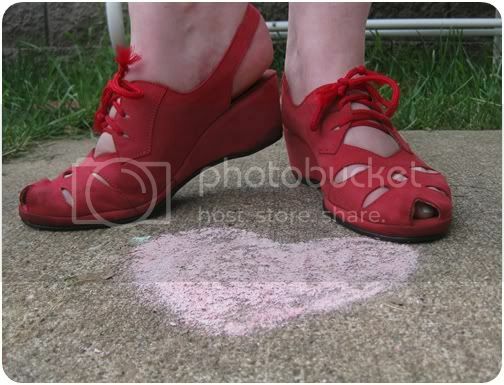 I'm always scoping out the dance store web site for new shoes. Your dress is amazing, as usual! I like everything about your outfit! Ah you look gorgeous! I LOVE that dress, particularly the diamond print, lovely! you are so cute, i love every single thing about this outfit! Love this outfit, especially with the punches of red, wow! The fabric you used is awesome, love how you turned around something that didn't fit into something so fab. I'll have to remember that idea in the future. 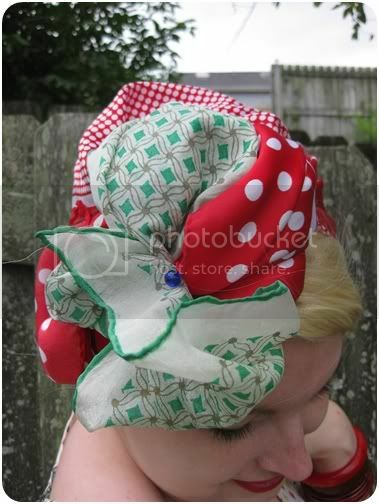 The turban is great too, I fear my hair will be up a lot this summer!